WINDS OF CHANGE: A few spots soared into the low 80s across Alabama yesterday; today will be a different kind of day following a cold front that passed through late last night. It will be much colder with a brisk northwest wind of 12-22 mph; lingering light rain early this morning will end, and the sky becomes partly sunny. Communities across the northern half of the state won’t get out of the 40s; for many places today will be 30 to 35 degrees colder than yesterday. Tonight will be mostly fair and cold with diminishing wind; we project a low between 25 and 29 degrees early tomorrow morning across North/Central Alabama. THE ALABAMA WEEKEND: Tomorrow will be cool and dry; with a mix of sun and clouds we project an afternoon high in the 50-55 degree range. Sunday will be a mostly cloudy day, and we will bring in the chance of a few rain showers as a warm front over South Alabama begins to move slowly northward. Sunday’s high will be close to 50 degrees, but 60s are likely over the southern counties of the state below the warm front. NEXT WEEK: Monday will be warmer with highs in the 60s statewide, and a few scattered showers are possible. Then, rain and few thunderstorms are likely on Tuesday with the approach of a cold front… the weather will stay mild with temperatures in the 60s. Wednesday and Thursday look cool and dry, but rain will likely return by Thursday night into Friday morning. 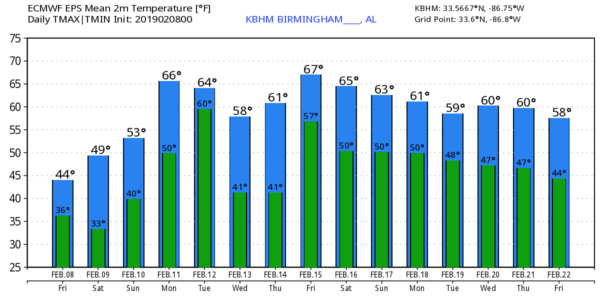 No sign of any excessively cold air, snow, ice, severe storms, or flooding for Alabama over the next 7 to 10 days. See the Weather Xtreme video for maps, graphics, and more details. ON THIS DATE IN 2013: A nor’easter produced heavy snowfall over the New England states. Total snowfall in Boston, Massachusetts, reached 24.9 inches, the fifth-highest total ever recorded in the city. New York City officially recorded 11.4 inches of snow at Central Park, and Portland, Maine, set a record of 31.9 inches. Hamden, Connecticut recorded the highest snowfall of the storm at 40 inches. Many surrounding cities picked up at least 1 foot. In addition to the significant snowfall totals, hurricane-force wind gusts were recorded, reaching 102 mph in Nova Scotia, 89 mph at Mount Desert Rock, Maine, and 84 mph off the coast of Cuttyhunk, Massachusetts. I have a weather program this morning at Glencoe Middle School… look for the next Weather Xtreme video here by 4:00 this afternoon. Enjoy the day!